Of all the powers Peter Parker received from a radioactive spider bite, arguably the most useful is his spider-sense, which warns him of impending danger. Of all the costume changes Spider-Man has undergone over the years, arguably the most logical is removing the webs from his armpits. They were just stupid. 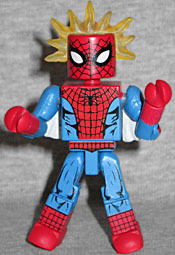 This Minimate gets new upper arms with the webs molded on the back. But that's not what makes him worthwhile: like the "Spider-Sense" name would suggest, this Spidey has a piece that plugs into his head-hole to simulate the wavy lines artists always drew to show his spidey senses tingling. It's translucent yellow and sits horizontally over the top of the head. The blue sections of his body are painted with muscles, and he includes a webline. Dispensing his own brand of vigilante justice, Frank Castle is often at odds with costumed heroes, and even tried to eliminate Spider-Man in the early days of his career. 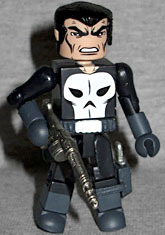 There have been a few Punisher Minimates, but the "old" look sets him apart. He has the slick, '70s-style hair and the deep cheeks seen in his first appearance. His costume back then didn't look quite like we think of it, either: the skull was less stylized and covered his entire chest, and his boots and gloves (inside the book, at least), were blue. Or "black," if that's what the colorist was going for. He's got a knife in the sheath on his left boot, a pistol with a silencer in the holster on his belt, and a rifle that's similar to the one he used in ASM #129 - except that one had a flat magazine, not a round drum, and it was red instead of silver. Still, the idea is clear and the execution is good.